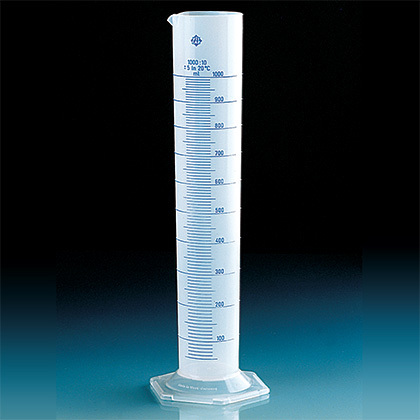 Product and ordering information for Graduated Cylinders, Class B. Tall-form cylinders are calibrated “to contain”. Hexagonal base design for greater stability. 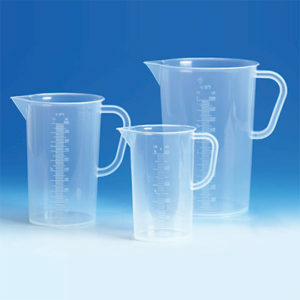 Available in highly transparent PP (polypropylene) or crystal clear SAN (styrene acrylonitrile copolymer). These tall-form cylinders are calibrated “to contain” Class B per DIN 12681 and ISO 6706 and have a hexagonal base design for greater stability. Available in highly transparent PP (polypropylene) or crystal clear SAN (styrene acrylonitrile copolymer), with molded graduations with or without overprint screening. PP cylinders can tolerate temperatures of up to 80°C, while the SAN cylinders can tolerate temperatures of up to 60°C, without causing permanent exceeding of tolerance limits. Are the graduations on your volumetric plasticware molded on the inside, outside, or simply screen printed? 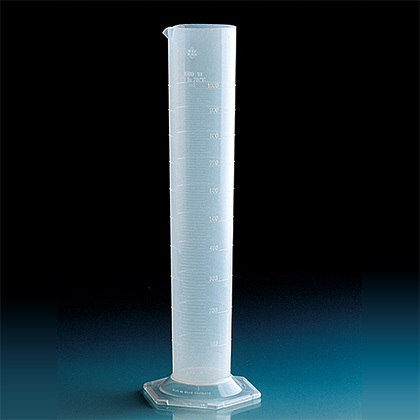 Graduated cylinders: All models have molded graduations. Some have screened overprint. Volumetric flasks: All models have a scored graduation, with coloring added. 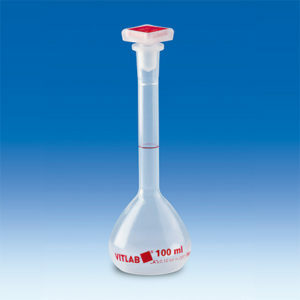 Erlenmeyer flasks: All models have screen printed graduations. Griffin Beakers: Most models have molded graduations (with the exception cat. no. 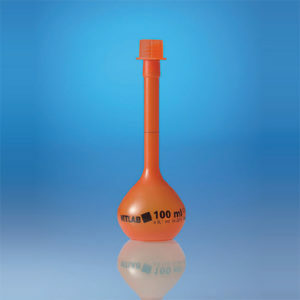 V110204-V111004, ETFE Griffin beakers, and some small volume sizes). Some have screened overprint. Graduated pitchers: All models, with the exception of the nesting models, have molded graduations. Some have screened overprint. Nesting models have printed graduations. How should I clean my volumetric plasticware? Polyolefins, such as PP and PMP, as well as fluoroplastics (ETFE), have water-repellent surfaces that are very durable and easy to clean. For cleaning, depending on the level of contamination, commercially available neutral or alkaline detergents (i.e. Mucasol) can be used. Please note that no scrubbing agents or scouring pads should be used for labware made from plastics. 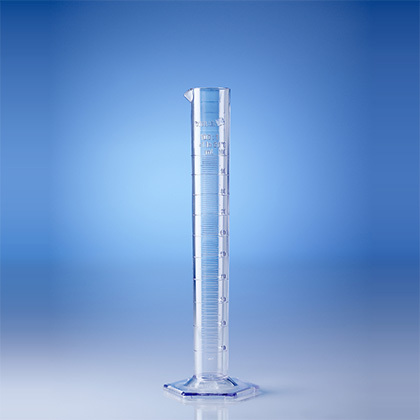 Plastic labware can be cleaned and dried in a laboratory diswasher, noting the temperature limits of the individual products. Due to their light weight, securing the labware with washing nets is recommended; and plastic-coated wire baskets will better protect against scratching. Plastic labware can also be cleaned in an ultrasonic bath. However, direct contact with the acoustic membrane should be avoided. Can I autoclave my volumetric plasticware? The product description and/or specifications state whether or not the product can be autoclaved (note the temperature limits!). If the product is autoclavable, the recommended protocol is 20 minutes at 121°C (2 bar), according to DIN EN 285. Prior to autoclaving plastic labware, ensure that no residual contamination remains on the item. Otherwise, the residual contamination will bake on solidly during the autoclaving process. Even substances that have no effect on the plastic at room temperature can have negative effects on the plastic during the autoclaving process, including persistant clouding. Additionally, microorganisms might not be killed effectively if they are protected by the residual contamination. Containers with screw tops or stoppers must be open during autoclaving to allow for pressure equalization - Autoclaving of a closed container will lead to the deformation or destruction of the container. Plastic labware should be stood upright on a level surface during autoclaving to avoid shape deformation - Plastic labware should NOT be laid on its side during autoclaving. No mechanical stresses should be present during autoclaving - For example, do not stack items. Do not autoclave any container that contains residual contamination or even rinsing agent. Some transparent plastics can absorb minute quantities of steam, which can lead to reversible clouding. This clouding disappears upon drying. ⚠ WARNING – These products can expose you to chemicals including Carbon black (airborne, unbound particles of respirable size), which is known to the State of California to cause cancer, α-Methyl styrene (alpha-Methylstyrene), which is known to the State of California to cause cancer, and Di-n-butyl Phthalate (DBP), which is known to the State of California to cause birth defects or other reproductive harm.